Firuz Yogbekov of Tajikistan, 21, is a third-year university student and president of the debate club Face-to-Face and English debate league coordinator at the Law Clinic in Russian Tajik Slavonic University in Dushanbe, Tajikistan. Firuz has used debate as a platform to discuss themes that are taboo in Tajikistan. Such themes include the spread of violent extremism, domestic violence, and economic expansion among the poorest populations in the country. 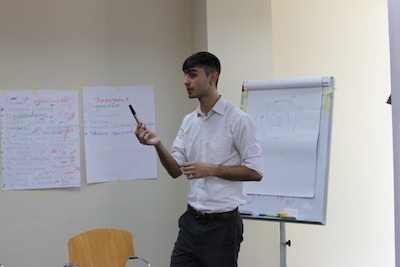 As a volunteer with Organization for Security and Cooperation in Europe (OSCE) for the past two and a half years, Firuz has led debate workshops in three of Tajikistan’s four regions. These workshops help spread awareness about violent extremism and terrorism—utilizing the dialogue skills gained during the trainings to discuss these issues. This platform has helped develop over 50 young debate trainers in argumentation, public speaking, and critical analytical thinking. In 2017, Firuz was one of the coordinators of a Debate Camp Project, where he trained 80 students in debate skills. Today, over 800 students have completed these debate seminars.